We arrived back from a freezing Joburg to a warm 26deg Vilanculos. Our luggage filled with pegs, three new pots with lids (the last lot lost their Teflon coating on passage due to scuffing), a tender anchor for Lexie, several magazines requested by other yachties, spares and parts, good old-fashioned South African Dri-Macs, more caps to hand out, new Polaroid sunglasses, a rolling pin (Kevin doesn’t always listen, no only kidding, want to try my hand at making Chelsea buns), some more fishing lures, bungee cords and some vacuum packed biltong. We met Chris, our pilot and hopped on the helicopter for the 10 minute flight to Benguerra, where Catatude was anchored. We had a beautiful flight over the bay and Catatude. I got to take some nice aerial photographs of the area. We were pleased that Catatude was none the worse for wear and prepared her for Jane and Kevin(Pedro), our other daughter and son in law, who were arriving on the Tuesday flight from Johannesburg and were going to accompany us to Bassas Da India. We left Benguerra on the incoming tide for Vilanculos at 3pm, as the next incoming tide during daylight would have got us to the airport after their flight had landed, the next day. After having their luggage thoroughly searched for anything worthy of a few dollars in customs duties, Pedro & Jane were released and we were on our way back to Catatude. Thankfully this time the transit and provisioning was uneventful and went smoothly. We were invited to a “bring and braai” on the neighbouring Yacht and met the owners of two other yachts there. It was a very interesting evening listening to these well seasoned yachties chatting about mutual acquaintances, extreme weather stories, theft from yachts and the hot Piracy topic. Yachties are such nice fella’s and by the end of the evening we were delivered back to Catatude with an invitation to come over for coffee to get an overview on the do’s and dont’s of Bassas. The day started with preparations. Weather checks, epirb (the transponder gadget) checks, drybag (the only bag you grab should you need to abandon the boat, containing flares, torch, water, portable sat phone, passports, first aid kit etc) , harnesses, life jacket issue, last emails, last phone calls, finding place for all the extra provisions, making sure everything on deck was securely tied down, making water, punching co-ordinates into the Max Sea and the Navnet systems and finding the night vision binoculars. We lifted anchor at 15h25 on the top of tide, so that we would reach Bassas in daylight and at low tide and weaved our way through the sandbanks across the huge bay and just passed through the gap of the two islands before sunset, to the open sea. The seas were rather choppy and confused but after our Inhaca incident, a walk in the park. We settled down to our routine of logging our position and details every hour and arranged our shifts and everyone got as comfy as possible . Our TV signal disappeared within an hour (not supposed to happen! this TV was perhaps not the best investment) and within two hours the triple S monster (stupid sea sick monster) arrived and we were all seasick. All except for Kev. With all the activity earlier that day I had forgotten to take and offer Stugeron. I dished them out and showed everyone where to find them. We were routing due east and with the main sail up on 1 reef and winds ranging from 14 to 18knots from a SE direction, we progressed rather well, considering the sea state and that we were beating (sailing into the swell) although it was not a comfortable ride. On my shift at 23h00, as I was reading my kindle, the depth alarm went off and reflected 1.4 meters. My heart nearly jumped out of my chest! I instinctively put the engine into neutral, thinking that we were off course or there was an uncharted reef somewhere that I had chosen to sail over. At the same time trying to silence the alarm that had now summoned everyone out of bed to see what the noise was. Its whale migration season! They swim under your boat and because they are so big, the depth meter gives you the false (well true) reading. We decided that if it should happen again our modus operandi would be to pull back completely on the power and wait for the whale to pass before moving on again. I have read about yachts that have been badly damaged by a sleeping whale getting a fright and using that powerful tail to swim away, flicking the boat in its wake. We had a further three depth alarms on the trip and as the following day progressed we had several whale sightings. There were also several container ships and trawlers that crossed our path but these were easily distinguishable as the AIS systems tracks their movements on the radar. I think this may be a shipping route from Madagascar to Maputo. On the second evening of sail our first main reefing line snapped/severed/broke so we were unable to use the mainsail unless on full. It was warm but we passed through several rain squalls (thank goodness we had the enclosed awning and windscreens fitted, they have been invaluable). Not a drop of wind or rain in the cockpit area. Pedro took the longest to conquer the SSS monster. Shame, he lost a kilo or two that’s for sure. I felt so sorry for him, he was 10 minutes at the helm and 10 minutes on the transom feeding the fish, throughout his shift. Jane took pity on him and sat with him on his shift. Early on Friday morning, through the cloudy horizon, in the distance was the unmistakable shape of the renown Bassas shipwreck. Everyone was excited as the atoll was insight and we all had a turn to inspect the unknown through the binoculars. 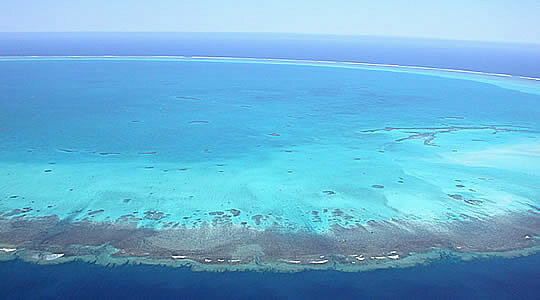 Bassas, as we now affectionately call this remote, shark-infested and treacherous outcrop, is a submerged volcanic atoll that lies 240 nautical miles due east of the Bazaruto Archipelago. 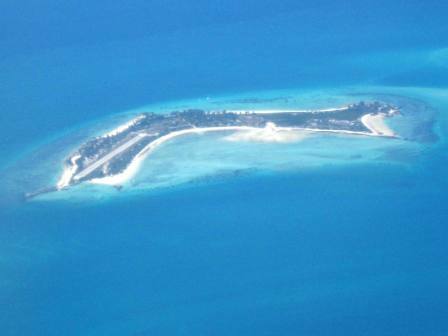 Bassas is visited almost exclusively by the occasional yacht. 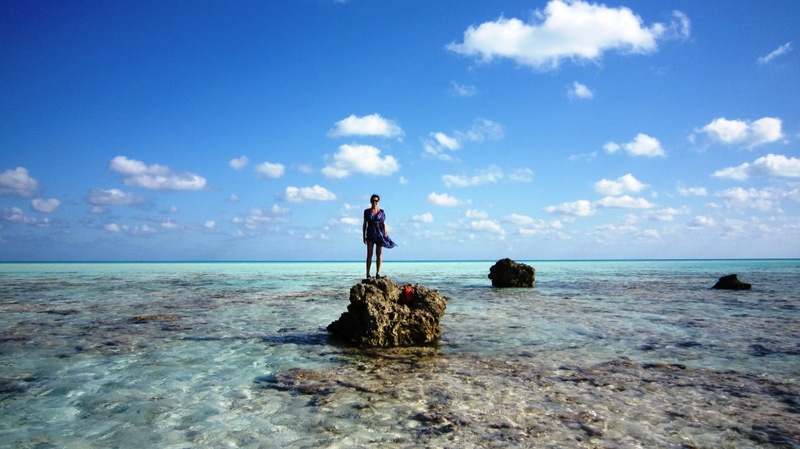 When the tide is high you can barely detect the atoll, only the jagged pinnacle of the New Holland shipwreck in the far distance suggests the presence of danger - but when the tide is low a vast ring of coral is exposed, enclosing a turquoise lagoon. 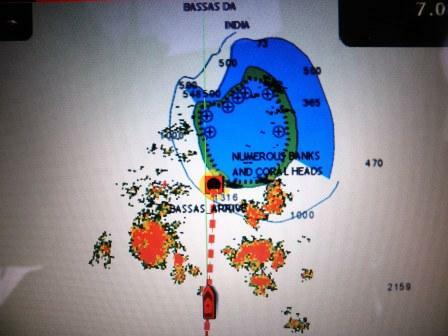 Bassas da India (previously called Basse de Judie) is an uninhabited, roughly circular, submerged volcanic atoll about 10 km in diameter, which corresponds to a total size (including lagoon) of 80 km². It rises from the seabed 3000 m below. 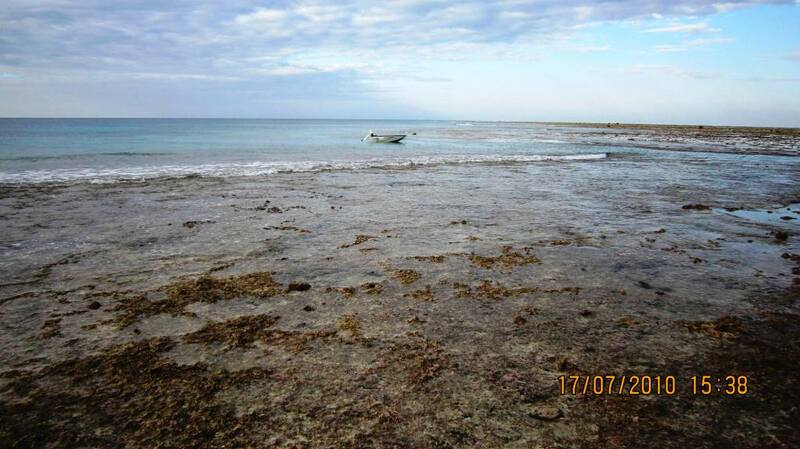 The reef rim averages around 100 m across and completely encloses a shallow lagoon that has a maximum depth of 15 m. The reef is completely covered by the sea from 3 hours before to 3 hours after high tide. As we approached ever closer, we could see that the Navnet charts, the printed charts and the max sea charts were out. The Garmin however seemed to be correct. We had planned our arrival at low tide so that we could see the rim as we were warned that the charts were inaccurate. 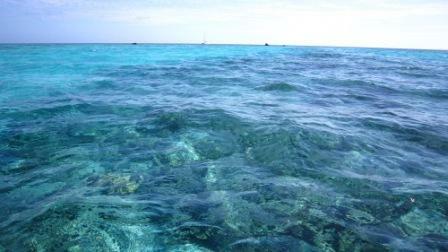 We edged closer and it was low tide exposing the reef and the rocks on the jutting out sandbanks bordering the rim. We carefully edged along at a safe distance towards the eastern side where we planned to anchor in a bay, protected against the prevailing South Easterly winds. Damn, the fishing lines were still out. 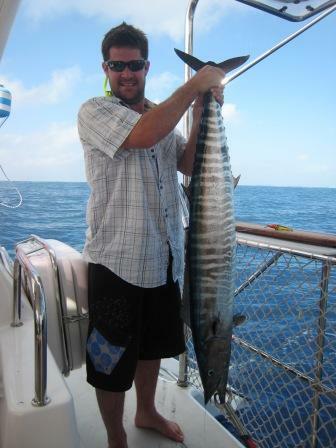 Zing went the rods and Pedro brought up a beautiful 30kg Baracuda. He was promptly released and the rods reeled in. If this was a sign of the ease with which one could net a big fish, we were way under refrigerated. We entered the bay and found the mooring ball which was put down by a Yacht charter company, and after a free-dive by Pedro to confirm suitability of attachment and condition of mooring, we attached our bridle to the mooring, using a shackle. We had arrived, were safe and secure and couldn’t wait to get onto the rim. The bakkie was lowered and we went ashore. The bakkie (our aluminium tender) was fantastic. It is a very hostile shore, with small jaggered, sharp edges. 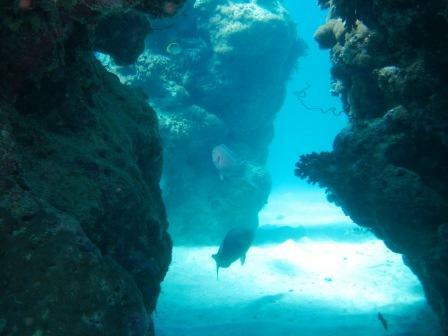 The sheer ledge which is always underwater is about 2m from waterline and drops down by 4 meters. So getting a conventional rubber duck tender in would be rather problematic unless it was a semi-ridgid tender, which could be dragged over the sharp surface. The bakkie just scraped over the top of all the coral and shards of volcanic rock and we stepped out. I wouldn’t have fancied a 2m swim from tender to land over that terrain! The little champion. Armed with our coral shoes we set foot on this most awesomely beautiful place with the deep azure blue inner circle and several very large shoals of dayglo blue parrot fish nibbling at the outer coral edge. It is breathtaking and absolutely no words or photographs can do it any justice. A wild untamed rugged but exceptionally awesome pristine place. At dusk we returned to the yacht and whilst Pedro and Jane trawled with the ’bakkie’, I took some time to tidy the boat. After 2 nights and 2 days of not cleaning, the boat was not as clean and tidy as usual, and the clutter everywhere was making me uneasy. We all settled down to an early dinner and then looked into the water from the transom at the fish swimming around. There were some kingfish and surgeons milling around. They were actually so close to the boat that Pedro was able to scoop one into the net, from the sugar scoop ( the two furthermost back parts of the boat that has small steps and the swim ladder)! Hey Kev (Knysna Kev) this is where you must come to collect tropical fish for your huge tank! We had an early night, tired from all the excitement and content that we were on a good anchorage, even though Kevin had set 2 drift alarms to make sure we wouldn’t drift off whilst we were sleeping. The next three days went by in a flash. Our days were filled with taking in all Bassas had to offer. A lot of fishing was done : we caught Wahoo, kingfish, red steenbras, humpback snappers, garfish, 2 sharks and a small Jobfish. When I say we, I mean Kev, Pedro(Kev) and Jane. I tried but it’s not really my scene. Too much effort, and oh those puppy eyes that the fish gives you whilst you are dragging him aboard. No, I can’t – I feel too bad for the poor fish. Kev and I are by no means accomplished fishermen, if fact this trip was a free fishing course. Pedro, who grew up at the coast in Mauritius taught Kev all about lures, bait, fishing knots, reels, rods, traces, jigging and many more fancy fishing words, terminologies and techniques. He and Jane even brought their own rods and reels and a fishing box full of fishing goodies. By the end of the 2nd day at Bassas they had caught and successfully released 15 big fish. 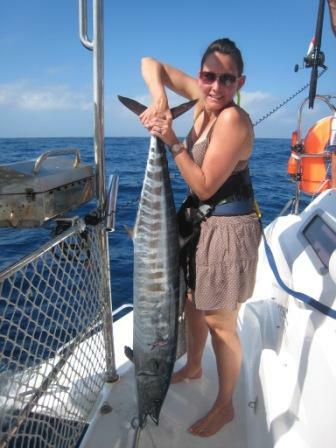 Kev managed to reel in a grey reef shark that was lurking about the boat, and he was promptly name Bertie. It was his first shark on a reel. It took a long time to get Bertie to the surface . I was very impressed with Pedro, as he made extra sure that every fish that was caught, that was not kept for eating, was released promptly, and that it was still alive until another fisherman or shark thought he was a good meal. He was also very fussy about size. If it was too big or too small it was not even considered as a suitable meal fish. Our freezers are still rather full, so we couldn’t really keep much of the catch beside the fish were mostly way too big to keep. When they fish recreationally the use hooks without a barb making the release as simple and quick as possible. We kept one Kingfish for dinner. Everyone knew the routine of first I leave and then they kill the fish. It worked well and I didn’t see anything bad happen to any fish, that I would have to feel bad about. I must say there is a lot of excitement, shouting, scurrying and passing of things to each other when a fish gets pulled on board. Its seems to be quite addictive to those that are keen on fishing. It starts with the zing or the rod bending and the words “Your on” being screamed by everyone who has noticed or heard the rod going. Its a race to see who gets to the reel first. Beware if you are in the way! The reel then gets ripped out of the rod holder and an assumption is made of fish type and size, by the pull and drag on the line. A contraption, called a bucket, (not a conventional bucket, a rubber thing to lean the rod against your body) gets tied around the fisherman/woman’s waist and after alot of time has passed with a lot of moaning and groaning, sighing and complaining, the fish finally gets to the boat. The scurry is frantic, and the commands are constant. “Mind your feet, pass the long nose pliers, the net, the other pliers, hold this, take that, bring a towel, the camera, mind the lure etc etc” All this happens whilst they are following the fish, to get the hook out of it’s mouth, as it shuffles along the width of the boat, trying its best to escape capture. If its a big wriggly fish they sometime do this boat width shuffle up to three times, with crew in tow trying to save the fish. Its actually rather amusing to watch and ends with a photograph and then the saving the fish procedure which is dragging him in the water by his mouth so that water can flow through his gills again until he is strong enough to swim off. The water temperature was 26 degrees so Kev, got out the diving gear and filled the dive tanks so that Pedro & Jane could dive. They dived everyday and even managed to bump into Bertie, Kevs shark, underwater on every dive! 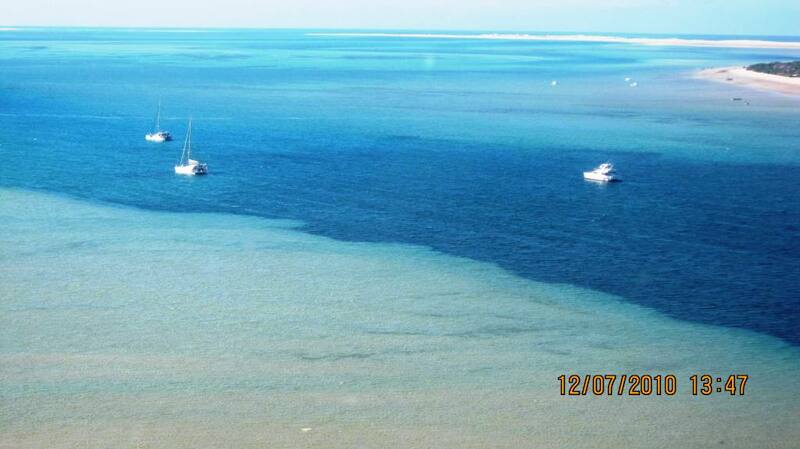 The diving was done from the yacht towards the shore and then all along the rim. The rim is full of caves, overhangs and swim throughs. A variety of fish are present and obviously very plentiful. There are beautiful huge colourful hard corals. Some of the fish spotted could not even be found in any of the many fish identification books we have aboard. Now, I know why the mainland locals call Bassas, Jurassic Park. There seemed to be 2 huge resident potato bass living just off our Yachts anchor, as they were ever present on each dive. I was the lookout and when they surfaced we collected them with the tender and gently towed them back to Catatude. The snorkelling was just as good and the best spots were so close to Catatude it was perfect. The Kev’s spent a whole afternoon snorkelling. At night many hours were spent with the fish identification books. Kev lifted me on the bosun’s chair (a chair type nappy used to lift and suspend a person from a rope) to the top of the mast so that I could get a better view of Bassas. You can only just see the other side of the rim on the horizon with the shipwreck perched on it. It is a very beautiful sight and I wished I could have flown over it low level as we had done over so many other bodies of water previously. At every low tide possible, we were on the rim, each one milling around in the water looking in all the ponds and crevices, exploring the reef. We were so engrossed once, that we neglected to notice that our tender had floated away and was heading back to Catatude. Fortunately Pedro saw it in time and swam to retrieve it. The parrotfish shoals along the shoreline were fascinating to watch as well as the many juvenile morays, colourful clams and abundance of small fish swimming in the ponds. There are no soft corals and very few very, very small sea urchins. Bassas is a photographers dream, whether it was sunset, sunrise, the constant visits from whales, posing with fish just caught, the diving pictures or the scenery pictures the constant shutter sounds were ever present. The camera batteries were permanently on charge (we have 6 x 12v charge slots). Canon Ixus is by far the winner, with battery life way outlasting that of the Sony, Fuji, Pentax and Olympus cameras present. We slept early and woke early, making the most of daylight hours, in this special place. We didn’t have to lock our doors, lift our tender or chain up our tender motors that we have become so accustomed to doing. The boat was littered with drying diving gear and towels, fishing rods and beanbags which we didn’t have to bring on or lock up as there was just no one around to worry about. We finally and perhaps for the first time, felt the true spirit of freedom sailing is supposed to represent. Kev had been printing out the weather forecast daily and as expected we awoke on Tuesday to a strong SE wind and overcast skies. The anchorage was fairly well protected against the wind but the swell which was predicted to be large was turning easterly which would place us in a lee shore position. We decided to pack up and move to the North western side of Basses where we would find protection from the wind and the swell, as well as an opportunity to see the infamous shipwreck of the New Holland. With tenders loaded and hatches secure we left the Eastern cove and motored towards the furthermost Eastern Point. 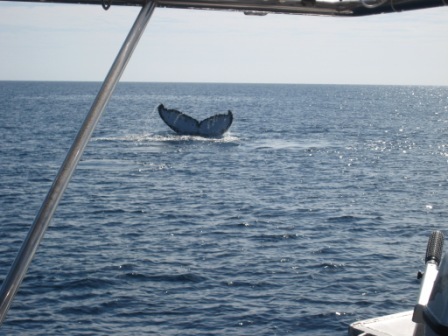 We had several ‘shows’ from whales on route and then hit Wahoo Alley. 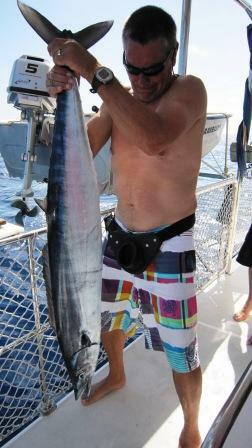 We caught 4 huge Wahoo in 1 hour, with them literally biting every 2 minutes from the time the line went into the water. These fish are big. Very Big. As we headed back north with one motor, we passed the huge anchor and old cannon on the exposed reef, of the ill fated Portuguese flagship, the Santiago that ran aground here in 1585. There is a small gap in the rim of about 3m wide that one could use to pass into the center with a tender if conditions were perfect. I would never, ever suggest that a Yacht sails into the center of this place. Its is just too unpredictable and the tide change too short. There are often breaking waves at this opening depending on which way the swell is coming in. 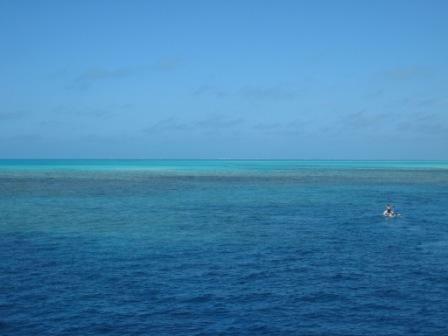 As we headed for the north western side of the atoll to see the Shipwreck, we hit another fishing gully. This time it was Yellow fin tuna and Skip Jack. Every time a rod went in, the bait was taken within minutes At times all the rods were being reeled at the same time, at other times the lines were crossed and the fish and the lures lost. It was a flurry of excitement as fish after fish was caught and released. We kept one pan sized Yellow fin tuna for dinner, which Jane caught. Kev cleaned the fresh tuna and the minute the sharks smelled the blood in the water we were surrounded by shark. Some were very big and they are quite brazen about coming right up to the surface next to the boat to see what was on their menu for dinner. I have never seen so many sharks in one place so close to me. Our tally for the day was 12 fish and the loss of several lures. Here we found the Garmin chart to be incorrect. The Navnet and Maxsea charts are off on the Northern and eastern side of Bassas and Garmin is off on the Western and Southern side of Bassis. They are all off by about a 1/4 mile, so on the chartplotter screen, it shows that you are sailing on the land! This took some getting used to. I took marks all around the perimeter so that we had a reference for the next trip to Bassas. We anchored along the northern side and Kev transferred fuel into main tanks to top them up again. Tired from the days hullly gully, we all settled down rather early to a delicious dinner of the freshly caught tuna Carpaccio and steaks. Our watermaker’s have been working very hard and hot showers all round are wonderful. At about 9ish everyone had retired to their cabins and taking the opportunity to have some ‘me time’, I sat alone outside, in the cockpit and went through the photographs that I had taken during the past few days, on my laptop. It was so silent and peaceful and I was so engrossed in what I was doing that when I suddenly heard a woooooosh sound behind me and water drizzle on the canopy, I nearly jumped out of my skin. My heart was pounding and when I turned around, I saw the big eye of a huge humpback whale winking at me, he was 1 meter from the boat! He had come to have a peek at what this contraption on the water was. It was so beautiful yet so scary to know that he was so close that his spray fell onto the canopy. I watched him in awe as he hung around for awhile before disappearing. The weather forecast predicted some possible bad weather (you never really know – the wind predictions are sometimes very underestimated and sometimes very overestimated) so we decided it was time to leave Bassas, whilst the going was good. We planned to leave late afternoon. As soon as we heard we were leaving, we all had last minute ‘still want to do’s’. We still wanted to climb onto the shipwreck, go into the center of the volcano, have a last dive, fish some more and needed more photographs. We launched Lexy and as it was a rising tide, we motored into the centre of Bassis. It was breathtaking. You are surrounded by the intense deep azure blue waters with the coral rim surrounding you, Catatude dancing on the outskirts. Beneath you, below the azure blue water is pure white sand up to 15m deep with 100% visability. It is just such a special place. We went back to wahoo alley to fish but it had become too choppy as the wind had picked up, so we returned for a final dive, and to prepare Catatude for the passage back to Bazaruto. The day had just flashed by and we had a final sundowner on the trampoline, each one reflecting on their special moments and thoughts of Bassas. There were whales all around us as we said our nostalgic goodbyes to this unspoilt piece of paradise. Aiming for the Northern tip of Bazaruto, we departed at 17h00 and with the wind and swell in our favour, we sailed silently for 3 hours on main and genoa (that’s both our sails up) into the sunset. At night the SSE swell (predicted) and southerly winds (predicted to be Easterly) brought choppy seas but we made excellent time of an average of 8.5 knots per hour for the 12 hour period. It was full moon and the sailing was easy. We decided on 2 hour shifts and I managed to get my kindle to read to me on my earphones so my shift went by very quickly. Morning brought a very lumpy big swell sea but nothing too bad. We kept the genoa up and sailed on with 1 motor to assist us. The rods were out and Pedro caught a beautiful male Dorado which everyone except me was keen on keeping. Fortunately, for him and me, he slipped off the transom of the boat once they had released the hook and yaah he was free! Then a tiny YF tuna, took a big red rapala lure but we let it go as he was very vey small. Thirty six hours later we arrive at the entrance gap between Benguerra and Bazaruto and I can hardly believe that the adventure to Bassas ever happened! We were 200 nautical miles from land and a million miles from reality. Its 5am and the depth meter is reflecting 1.2m at the arrival gap, when Kev decides that conditions are not good enough to sneak through and that we should rather go around. All the cell phones onboard go crazy, beeping and messaging as we come back into signal. I glance at my Blackberry and see the message from Julie “Yay, i’m glad to have my Mom back”. I just smile. While we are all re-touching with the world a few whales do a show for us. Dancing and flipping and surfing our wake. We have all but lost count of the number of whales and calves we have seen during the past few days. We turned round the point of Bazaruto, passed Paradise Island then on to Benguerra. We arrived at 3pm, to the yelling of Phillipa on Salty Dog, crapping us out for staying 2 days longer that intended and not letting her know! She had been worried about us and made no bones about letting us know how she felt. At 4pm we headed for terra firma at the pub at Benguerra Island and swopped stories with whoever would listen. Kev, went on a squid catching lesson with Jane and Pedro. I’m not too sure that he learnt too much, as all I heard from Catatude, was the sounds of extreme laughter and jovial conversation coming from the torch lit tender. He did however come back somewhat pickled, covered in ink, (Yes his Pringle shirt aswell!) with a few squid. Dinner was fresh calamari risotto and lights were out by 10pm. Everyone had had such a filled past few days that it was starting to catch up! Saturday arrived and it was Kev’s birthday. Not too much you can do to make it an extra special day, on a yacht with no shopping malls and no fancy restaurants. Nevertheless we made his day as special as we could. Pedro and Jane came laden with beautifully wrapped gifts for him, so we had a celebratory breakfast and he opened his gifts, all practical, useful stuff (including some calamari lures). 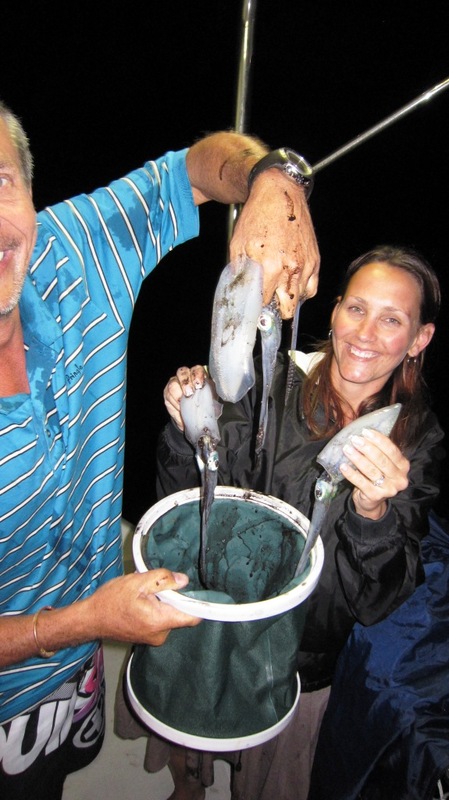 I couldn’t help but wonder how I would cope with the messy, inky calamari catching session once Pedro and Jayna had left! That will probably be another whole story! We were interrupted by the sound of a mini choir singing happy birthday. 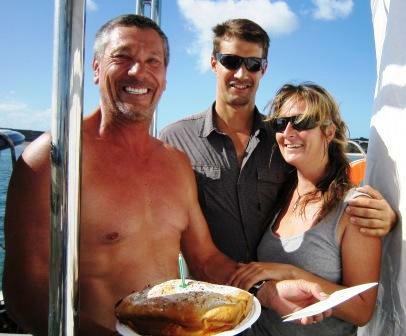 We turned to see Robert & Phillipa, from Yacht Salty Dog, freshly baked cake in hand (with candles), singing happy birthday at the top of the voices. It was such a nice gesture as the chances of me baking a cake were pie in the sky and pretty much impossible. (I don’t think anyone would eat some of a cake that I baked anyway, as it would probably be awful. I know my limitations and I am the one that would probably do something stupid like adding salt instead of sugar to the recipe!). Phillipa had made Kev a gift of a handmade chessboard with the chess pieces being of out of shells. Must have taken ages for her to collect all the matching pieces. Yacht Salty Dog, had no water as their water maker had packed up and the crew were waiting for one of the yacht owners to visit, and to bring the part to fix the watermaker. They had been getting water from the lodge in cans, or bumming from other yachties for the past 8 weeks! It was so bad that after a dive Phillipa would ask Robert if she would please rinse her hair! I think that if I was in their shoes I would have drawn the line long ago. We agreed to use our watermaker and fill their tank for them. 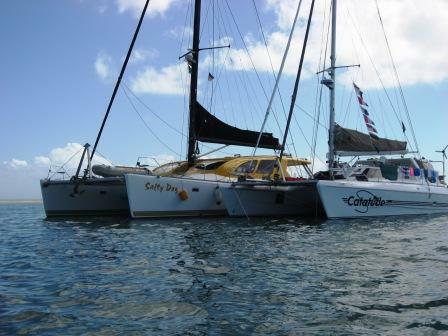 With fenders out, they parked alongside us (we fell like David and Goliath – their boat is so huge 60ft yet little old Catatude had the working watermaker). This was quite a procedure but Robert came alongside Catatude with German precision (he is German) and within no time we were producing water. Kev had rigged the hosepipe directly to the watermaker, out of the hatch over the deck, over the gap and into Salty’s watertanks. Their tank capacity was 1000l and it took several hours. The photos tell the story. Our local Fishermen (Francesco and Almerica) were pleased that we had returned and came by promptly to trade crayfish. We had fresh crayfish for lunch, and then set sail for Vilancoulos on the mainland, as Pedro and Jane were flying home the next day. We celebrated Kev’s birthday again with a very pleasant dinner at Vilanculos Beach lodge. That’s pleasant as in company, definitely not food quality! We once again used Phillip to take us to the airport to see Pedro and Jayna off. Its harder to say goodby when you are away than when you are at home. It seems so long-term and your kids have a special place in your heart that they fill. But the call of the freedom and the ocean still nags and once the plane takes off its back to serious business of doing nothing, I mean doing everything, again. We lunched on the lawn, did some washing (I still hate it! but now washing dishes has topped my list of pet hates) and retired to Catatude, just the two of us once again. Next on our agenda is Madagascar. I can’t believe time is moving so fast! Luv 'n miss you all ! Next newsletter . . . . .